Perhaps I did not give any authors enough humanoid monsters to work with in their Urban Fantasy. So this post will present three that might not have ever been considered before. I did write a few stories with one of these guys. Wonderful stuff. One of the first characters I have to say I fell in love with. A Wild Man is a man that lives on the outside of society, he is usually covered in fur. And is the master of the forest. Unlike a bigfoot, he is closer to man than animal. He has a small social structure. He will marry and have children. He lives in a hut, but controls the forest. 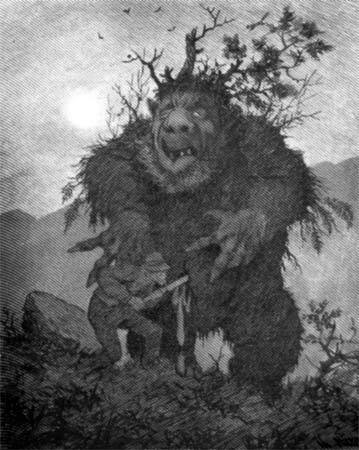 The wild man or woodwose is a mythical figure that appears in the artwork and literature of medieval Europe. Images of wild men appear in the carved and painted roof bosses where intersecting ogee vaults meet in the Canterbury Cathedral, in positions where one is also likely to encounter the vegetal Green Man. The wild man, pilosus or "hairy all over", and often armed with a club. The image of the wild man survived to appear as supporter for heraldic coats-of-arms, especially in Germany, well into the 16th century. 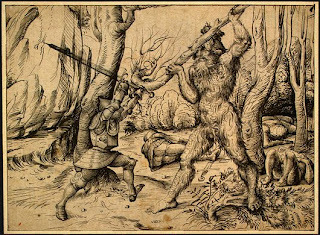 Early engravers in Germany and Italy were particularly fond of wild men, wild women, and wild families, with examples from Martin Schongauer (died 1491) and Albrecht Dürer (1471-1528) among others. The Huldra is a female with a cow's tail or bark for skin. 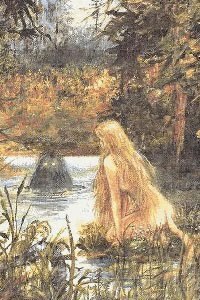 Seen from the front she is a stunningly beautiful, naked female being with long hair; from behind she is hollow like an old tree trunk. In Norway she has a cow's tail, and in Sweden she may have that of a cow or a fox. In Norway she has often been described as a typical dairymaid, wearing the clothes of a regular farm-girl, although somewhat more dazzling than most girls. Close to nymphs. These women would lure men into the woods, have their way with them. If they like the man, he lives, if not, they will kill him. They will also marry humans. There are males called huldu. Trolls don't live just under bridges. They are usually ugly, strong, and a bit dumb. Yet, if you do not mess with them they will be good natured and nice. In Hellboy 2, you got to see a whole society of Trolls, living in New York City. Trolls are described as being of any size, great or small, and of having one characteristic in common, they are very ugly, with small, beady eyes and large, bumpy noses. Their appearance is usually on the sloppy side with bits and pieces of last week's meals stuck to their stringy hair and clothes. Their ears are mostly large and floppy and dirty enough to grow rutabagas in!! They are also not too careful about brushing their snaggley teeth, which is not very obvious as they do not smile that much anyhow. (Maybe they don't brush them because their mouths are so very large.) They are also ugly and sloppy in their behavior, which is of more importance than their appearance. Trolls are still very popular. 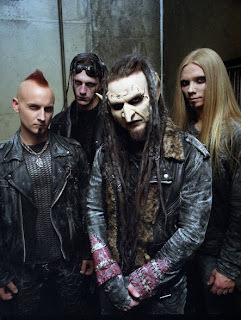 Bands like Finntroll and Mortiis keep the legend alive. There you have three humanoid creatures that could work their way into urban fantasy. 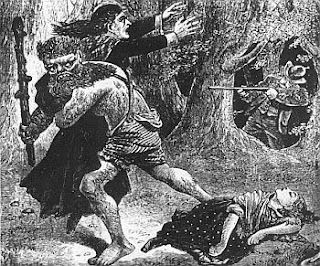 I am partial to the wild man, but I think trolls could be fun too. I love this idea of reviving new types of mythical creatures. The novel I'm writing now happens to have a teenage troll, who is an orphan and not really sure what he is. He's very self-conscious about his trollish features, even though everyone else sees him as a human. After living homeless for years, he was finally taken in by a cult, and that's where we meet him. The huldra seems really interesting. The image of them being partly-hallow is haunting.